Georgian Bay – Where the Good Life Is The Way Of Life. At ICFhome.ca, we know that few decisions are as important as choosing a place to live. So let us share with you, our vision of “Woods by the Water”, the place that is is quickly becoming Georgian Bay’s most prestigious address. Nestled amid a canopy of pines, oaks and maples, blended with a spectacular scenery of emerald green farmer fields, is a place where dreams of the good life become reality. ICFhome.ca invites you to be part of the “Woods by the Water” exclusive community, a collection of beautifully forested 1.5 acre lots to build your four-season retreat. Lots include your own direct access to our private sandy Beach Club on the sheltered shores of Georgian Bay, opposite Christian Island. Less than an hour’s drive from the City of Barrie lies this gorgeous expanse of crystal clear waters ideal for boating, sailing and swimming, a distinct alternative vacation destination to Lake Simcoe, Muskoka, Horseshoe Valley and Collingwood. Come and live in synch with nature and the outdoors in a spectacularly peaceful environment today. In accord with untouched nature’s enhancement, which offers the lifetime experience of living the traditional way with all the elegant luxuries you want, capture the beauty of unchanged environs and enjoy the complete piece of mind far from the maddening crowd of the city. Break free from the polluted and hectic city life and indulge in the luxury of your country estate. Each property is laid out in perfect harmony with nature, promising beauty and privacy. A game of soccer with your family, tree climbing with the children, endless hours amongst mother nature. Let us take you down the memory lane. At the heart of “Woods by the Water” is a natural, unspoiled environment that will fulfill the expectations of anyone for their ultimate dream residence. Here, you will find a sheltered, peaceful landscape overlooking a secluded channel on the southern tip of Georgian Bay, rich in amenities and spectacular panoramas. For a privileged few, “Woods by the Water” will be the opportunity of a lifetime. 100 Minutes from Toronto (weekend traffic is far less than other destinations such as Muskoka) It’s a much easier drive on a busy weekend compared to most recreational destinations – the last half of the drive (from Barrie to Cedar Point) is widely through picturesque, quiet rolling farm country. Click here for more info on Georgian Bay. The area has a rich history – By 1639, French Jesuits founded Sainte-Marie among the Hurons, Ontario’s first European community, on the Wye River – In the early 1840’s, families from Quebec, attracted by promises of cheap and fertile land, came to the area of Tiny Township and settled on the present site of Lafontaine, just minutes from Cedar Ridge. Adjacent to Cedar Ridge you can connect with the main snowmobile trail and will find many cross country ski trails. The nearby Tiny Township Trail system is 22 kilometers long with 13 bridges that crisscross meandering rivers, streams and intersecting concession roads that you can take full advantage all year long hiking, biking, snowshoeing, horseback riding and more. Outside finishes are stone and wood siding. Inside you will find three bedrooms and two luxurious bathrooms with soaring vaulted and coffered ceilings. Flooring is made of natural stone and hardwood. 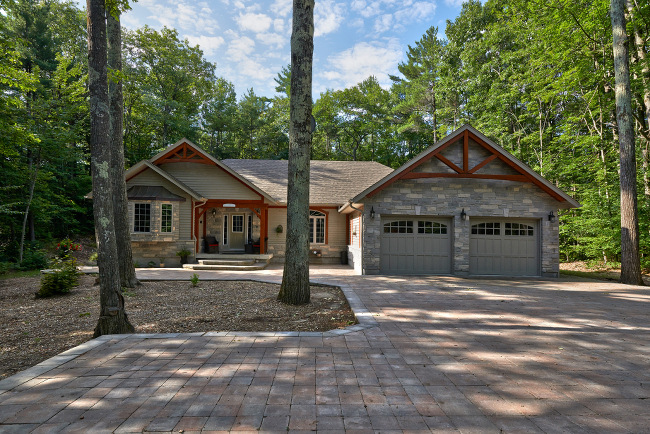 Stone fireplace, custom kitchen, radiant floor heating, on demand water heater, HRV, high-efficiency air conditioning, 200 amp service.